Published November 27th, 2006	in Shopping Promotion. 10 Comments	Tags: Christmas, Credit-Card, Sony. This offer from Sony will make a great Christmas gift for my “budget-cautious-self”. I have already signed up for it two times in the past and will do it this time around. What is it? It is a credit card from Sony. You apply for it, make one purchase, and get a $150 bonus in a few weeks (the amount is credited directly to your new card). That is all. The last two promotions were for $100. It looks like Sony has sweetened the deal this time around. There is no sign-up fee, no annual fee, and you don’t have to keep the card once you get and spend the $150 (although I should say it is not a bad cash back card overall — you get 1% back on regular purchases, 3% on all Sony products, and 5% on anything you spend at the Sony online store). Offer expires March 31st, 2007. Your first purchase must be made by June 30, 2007. An added benefit until January 4, 2007 — get 10% back on your purchases at the Sony online store (instead of the usual 5%). Read more about this offer here. when I follow your link to the Sony site it offers only $100 back for some reason. I am interested in pruchasing a sony camera from Circuit City I would like to know if I will receive the $150 bonus if I use my sony card on this item? Have you applied for the card using the link above? If you did and already received your card in the mail then any single purchase will qualify you for the promotion (including the Sony camera). 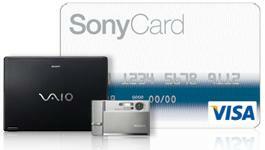 Do I have to make my first purchase through sonystyle.com to qualify for the $150 card credit? Nope. Any purchase will do. I bought a gallon of milk in Walgreens. Hi, I was wondering if this would work if i transfered a balance over to the sony card? It has to be a purchase made with a new card. By the way, I received mine last month, made a $2 charge on it (I bought a gallon of milk at Walgreen’s) and now I have $150 credit. Isn’t it sweet!